Svetlana Kim’s remarkable story opens in Leningrad, Russia, on a frigid winter afternoon. Standing in the bread line for the third day in a row, she listens as her neighbors discuss the impending fall of the Berlin Wall. Life as a student in a crumbling country offered few possibilities for the ambitious young woman, so when a former classmate offers her a plane ticket to the US., she jumps at the opportunity. She arrives in New York speaking no English, with only a dollar in her pocket. With the help of a good Samaritan, she travels by bus to California, hoping to connect with an acquaintance from home. Yet when she mistakenly disembarks in San Francisco instead of Sacramento, she finds herself penniless and alone. What unfolds is a miraculous story of survival as Svetlana encounters kind strangers while she struggles to cobble together a meager existence working as a cleaning lady. Determined to succeed, she lands a job selling cosmetics. Within a few years, her hard work carries her up the corporate ladder. She earns American citizenship after living ten years as a political refugee, and gains the opportunity to become a stockbroker. In her career as a stockbroker, Svetlana is introduced into the realm of powerful businesswomen and politicians. Through it all, when her nerve threatens to fail her, she returns to memories of her grandmother, White Pearl, whose parents immigrated to Russia from Korea. As a girl, White Pearl was among 200,000 Soviet Koreans deported to central Asia by Joseph Stalin, who feared they would spy on behalf of the Japanese. Svetlana reflects often on her grandmother’s tales of that hard time, drawing on the strength of her beloved babushka to enable her to make the very best of her own life. 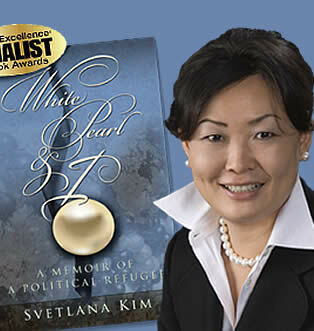 White Pearl and I is a modern and uplifting account of Svetlana’s tireless search for the American dream. Autographed copies available. Information and pricing available on request. Please submit your information on the contact form. Discounts are available when ordering 10 or more books. White Pearl and I available at local booksellers or online from one of these sources.